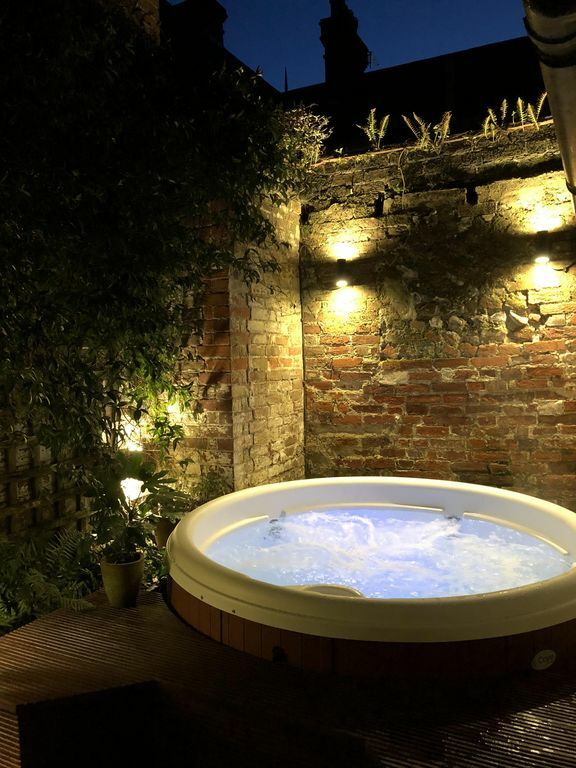 Quaint and quirky historical cottage with private hot tub set in secluded courtyard. Just 10 minutes from the beach and close to the heated pools of Arundel Lido. Perfect for a weekend away or a longer holiday to make the most of the West Sussex countryside. Wood burner in the open plan sitting room to cosy up to in the evenings; or in summer you can open the french doors onto the well-lit courtyard to enjoy the private hot tub or your morning coffee. The recently fitted kitchen is well equipped with all mod cons (including coffee maker) . The sitting room leads onto a downstairs bathroom with power shower. Convenient parking in public carpark in 30 sec walk from the front door. Please note that stairs in this property are steep. We can provide a stair gate upon request to stop toddlers from roaming . Please note that during Arundel Festival (18th-27th August) there will be live music that will disrupt any attempts at an early night! Wonderful week of music, theatre, food, drink and a dragon boat race, but please do not book during this period if you don't want to be joining in with the weeks festivities- noise levels are high! Fridge can be stocked on request. Essentials such as milk, coffee and tea will be stocked. Dining table in open plan sitting room seating 4 adults plus a highchair. Based in the centre of Historic Arundel, the cottage is perfect for exploring the town, castle, antique shops, restaurants and pubs, or perhaps to hire a boat for a trip along the river Arun. For the more active, Arundel Lido is on the doorstep where you can enjoy the view of Arundel castle while swimming in the heated outdoor pools. The Wildfowl trust is a few minutes walk, as well as tennis courts, putting greens, play ground and the 1000 acres of Swanbourne lake. Horse riding is available from one of two stables based in Arundel. Its a great place for families. We are just 20 minutes from Goodwood racecourse, 10 minutes to Climping/Littlehampton beach and 10/15 mins from the golf courses at Littlehampton and Worthing. Wittering Beach is 30 mins away where you can kitesurf, windsurf or fossil hunt! Perfect for ramblers, hikers, mountain bikers (jet wash & secure bike storage available) the cottage lies directly on the Monarchs way and just minutes from the South Downs Way. I checked out around 9am Sunday morning, so I am x24 hours later than I would have liked to give this feedback. The home is fantastic and my other half and I had an amazing time. We would very much like to stay again over the summer period. Couldn't have been better would and have recommended the place to all my friends and work colleagues. The location was great, right in the centre of Arundel but also secluded enough that it was quiet and comfortable. All the amenities we could’ve wanted were provided and the wine on arrival was a lovely touch. Antonia was very helpful when we had questions and we would definitely stay again. Thank you for such a lovely review and so glad you enjoyed your stay- hope to see you again soon! Home away from home, cozy retreat! We had a lovely week in this adorable cottage this summer. We were there for the Arundel Festival. It was an amazing location, had everything we needed and even a hot tub, which was perfect after a day of walking around exploring the town and surrounding area. We felt like it was home away from home as it was very comfortable, with hotel touches. The bathrooms and kitchen are modern and nicely done. It had a few things in the kitchen (condiments, tea, coffee etc) which was handy, and even things like dish and clothing soap that we needed, but hadn't brought with us. The view from the top room is amazing. The little patio area is cozy, and private. We definitely want to stay there again! Im so glad you enjoyed your stay. Thank you for leaving a review and your kind words- hope to see you again soon! Wow did this place delievery, we stayed here for a couple of days. My concerns going in, were about the parking and that we were going to be out on the edge of town. Well parking was not an issue at all. There is plenty of parking and yes you have to walk for 30 seconds to the front door, you can pull up to the front door to load and unload. Cost wise, we used the RingGo app and meant I could add time to the parking as required from my phone. All day parking is less than £6, but as we were out and about during the day we actually didn't spend more than £3.20 per day. The location, you are very close to the river, watching the river flow from the top bedroom window is great, but you are 20 seconds away from it. Good shop is 30 seconds away, then a walk to town is 2 minutes away. From all of this, you are very close to everything. The lido is next door, which is great if you want a swim, but we actually went to the beach instead. The kitchen is very well stocked, they seem to have the great policy of not throwing away food from previous guests, which means we could have eaten several meals without actually shopping. The rest of the house is great, 2 big bathrooms, 2 great bedrooms. Must not forget the hot tub, we really enjoyed that. The most important question I always ask myself is would I go back, a massive yes, this is 1 place we plan to return to. Fantastic place to stay was so homely. It's a real retreat and so comfortable. We had a wonderful time there, the kitchen had everything home from home. We loved spending time out in the court yard during the evening. Beds were super comfy and the shower was powerful. Would definitely recommend. Our cottage is less than a minutes walk from Arundel Castle, a must see for all historical enthusiasts! We are also walking distance from boat hire for cruising along the River Arun, from Arundel Museum, Arundel Brewery, Abbey ruins, Swanbourne Lake (1000 acres of lake and downland walks. Boat hire available), putting greens and tennis courts, childrens playground and Arundel Wildfowl Trust. Mountain biking is possible from the front door as we are minutes from the South Downs Way, and for hiking enthusiasts we are directly on the Monarchs Way. The south coast is home to some fantastic vineyards, which are worth a visit if you are a wine lover. including Tinwood in Halnacker, (9 miles) Nutbourne and Stopham both in Pulborough (10 miles) and Highdown in Worthing (8 miles). Golf courses are 3.5 miles away at Littlehampton or Avisford Park. Goodwood Racecourse is just 12 miles away.